Robert Steuteville is editor of Public Square: A CNU Journal and senior communications adviser for our friends at the Congress for the New Urbanism. The following article is republished with permission from Public Square. There is some truth to that point of view. Redfin found that a 1 point rise in Walk Score adds nearly 1 percent to the price of a home in a survey of 14 US cities. So, should we build more sprawl to create affordable housing? Is walkability an extavagance that adds nothing essential to day-to-day living? On the contrary, the evidence strongly suggests that walkability lowers overall household costs while contributing substantially to individual families’ needs. In metro areas, the most affordable places to live are walkable neighborhoods. Walkability adds material value to a home that millions of people are willing to pay for, as reflected in the Redfin survey, and market demand is growing for walkable neighborhoods. At the same time, walkability also lowers transportation costs and allows for a wider range of housing types, some of which are more affordable. Housing prices are rising in many walkable urban neighborhoods, generating concerns over displacement and gentrification. Partly this is due to long-depressed housing values in these neighborhoods that have now reversed—but the trend is also due to public policy. The development of new housing in walkable neighborhoods is severely constrained by zoning and infrastructure. A recent report by Touro College professor and Strong Towns member Michael Lewyn details how America’s most expensive cities—like San Francisco and New York—have highly restrictive zoning laws and approval processes for new housing. To address the nation’s affordable housing problems, we should build more housing in existing walkable neighborhoods, build more walkable neighborhoods in general, and lower the barriers to building them. Most analyses of affordability focus only on the cost of housing. The most common standard for affordability is that someone should not pay more than 30 percent of one’s income on housing. But that is a misleading and incomplete analysis—each house comes with a location, and the cost of transportation varies dramatically depending on walkability and transit service. The Center for Neighborhood Technology’s Housing + Transportation Affordability Index (H&T Index) combines housing and transportation cost data for every address in US metro areas. H&T costs together are a better measure of household costs. CNT prefers the affordability standard of 45 percent for housing and transportation combined. The H&T Index reveals that walkable places reduce combined housing and transportation costs. The 25 largest traditional cities (combined Walk Score of 78, very walkable) have 19 percent lower combined housing and transportation costs than the 25 largest sprawling cities (combined Walk Score of 40, automobile dependent). In traditional cities, non-automotive commuting is 7.5 times higher and automobile ownership is a third lower. See the table below, which I created from H&T data and other sources. Even without taking transportation into account, the actual price of housing in walkable city neighborhoods is more affordable than popular perception would indicate. The priciest walkable neighborhoods are usually offered as examples in news articles because these are the best known. These include Georgetown in DC (Walk Score 97), Society Hill in Philadelphia (Walk Score 99), Newbury Street in Boston (Walk Score 91), Pacific Heights in San Francisco (Walk Score 96)—all neighborhoods that are popular with visitors and journalists. Few people think about lesser-known neighborhoods on street grids, miles from downtown—but these are far more common than the tourist-rich historic neighborhoods. They may not have Walk Scores in the 90s, but they are still walkable. The Redfin numbers control, as they should, for differences in house size, type, age, and condition. Yet a wider range of housing is available in traditional cities compared to their suburban-style counterparts—which consist mostly of detached single-family houses. The so-called “missing middle” provides affordability, although this does not show up in apples-to-apples comparisons with the suburbs. Furthermore, traditional cities have a lot of old housing. In the most expensive neighborhoods, the great majority of this housing is fixed-up, modernized and expensive. But in many city neighborhoods, a good portion of this housing is in mediocre-to-poor shape, and it is cheap. Much of this housing is in neighborhoods with high crime and poor-performing schools, which keeps costs down. That’s not a good tradeoff, but it contributes to affordability in city neighborhoods. Many walkable neighborhoods have low housing and low transportation costs—a combination that is affordable even to low-income households and is available nowhere else in metropolitan areas. That reality helps to explain why a disproportionate share of poor people live in traditional cities. They choose walkable neighborhoods partly for economic reasons. New housing construction in cities is often constrained by NIMBYism and zoning, as Lewyn reports. Moreover, the creation of new walkable neighborhoods—once a routine activity of cities and towns—is severely constrained by zoning and infrastructure. 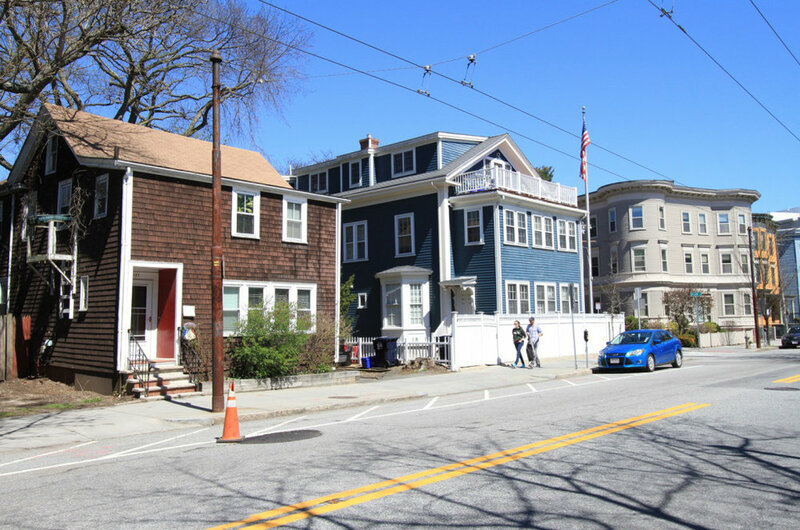 Building new housing in existing walkable neighborhoods and the creation of new walkable neighborhoods are two distinct but related problems, and this distinction is little understood by many policy wonks and commentators. Prior to 1950, building new walkable neighborhoods was easy. A city or town would plan out a new area of street grid and builders would construct houses according to existing building codes. But after 1950, street grids were discouraged by public policy and almost never built. Planners and traffic engineers laid out new communities in dendritic street patterns, designed like the branching of trees. These patterns now make up the vast majority of our metro areas, funneling traffic from isolated subdivisions onto high-speed, high-volume arterial roads that are dangerous and repellent to pedestrians. Building new walkable neighborhoods within such street patterns is highly problematic—a task that modern zoning, with its separation by use and building type, makes even more difficult. These twin problems, which limit the supply of walkable neighborhoods, are very much operable today. Planners and transportation engineers could change these street patterns and free up the market to build new walkable neighborhoods, but this practice is highly resistant to change. During the last half of the 20th Century, market forces favored the suburbs over cities, which helped to maintain low costs in walkable neighborhoods. This was a mixed blessing for low-income residents. Many city neighborhoods saw little or no investment for many decades, partly because property values did not justify maintenance. That meant that tens of thousands of homes in places like Philadelphia, Detroit, Buffalo, and Baltimore became uninhabitable and rotted, collapsed, or burned to the ground. But this century, demand has grown for historic, mixed-use neighborhoods and new, middle-class residents have moved in—accompanied by developers. New and old residents of these rising neighborhoods see real value and utility in walkability. For one thing, the degree to which a neighborhood is walkable translates directly to basic transportation. In America, we spend a lot of money on cars, and few people would call these expenses a “luxury,” unless you are driving around in a new Mercedes. The cost of driving a mile, according to the IRS, is now 53.5 cents. Living in a walkable neighborhood, versus a suburb, can easily cut driving in half, reducing expenses by $5,000 or more a year, a savings that is realized after taxes. A walkable neighborhood essentially provides a family with an equivalent value in transportation. If transportation is not a luxury, it follows that neither is a walkable neighborhood. One motivation for millennials to move into walkable neighborhoods is to avoid the expenses of a car—especially since many of them still have student loans to pay off. People in less walkable areas are more likely to be obese and to suffer from diabetes and other obesity-related diseases. For example, one study by three Arizona State University scholars created a “walkability index” (measuring the distance of churches, schools, and entertainment from neighborhoods studied) and found that a "1 percent increase in the walkability index of a neighborhood is associated with a 50 percent reduction in the likelihood that it will belong to a high disease as opposed to a low disease cluster for obesity . . . 49 percent lower likelihood for diabetes, 39 percent lower likelihood for hypertension, and 40 percent lower likelihood for heart disease …. " Nobody would say that health is a luxury. To the extent that walkable neighborhoods contribute to health, it follows they are not a luxury good. Similar cases can be made for walkability and safety (fewer automobile deaths and injuries), pollution (reduced tailpipe emissions), and time (fewer hours spent commuting). Walkable neighborhoods add value and utility to lives of people of all classes. They are willing to pay for that value. Walkable neighborhoods also enable a lifestyle that has the potential to reduce overall costs while providing health and welfare benefits. Walkability is not a luxury or an extravagance for the elite, although it may feel luxurious at times to be in a human-scale neighborhood. Walkability contributes to basic necessities and is a rational, market-driven choice for a substantial and growing number of Americans. It is a key to greater affordability. Public policy should respond by both reducing the barriers to building housing in walkable neighborhoods—and allowing more walkable neighborhoods to be built.